Here's a fast, simple answer to your edge sealing problems with SIGNGOLD and other vinyl applications that require edge protection from washing, polishing, and excessive physical contact. Each Sealitpen is filled with One Shot brand 4005 UV blocker acrylic clear, for a fast-drying (15 minutes), long lasting edge seal. Each pen will seal approximately 10 sets of truck doors. When the time comes to remove the graphics, simply clean the surface with mineral spirits to remove any remaining sealer. 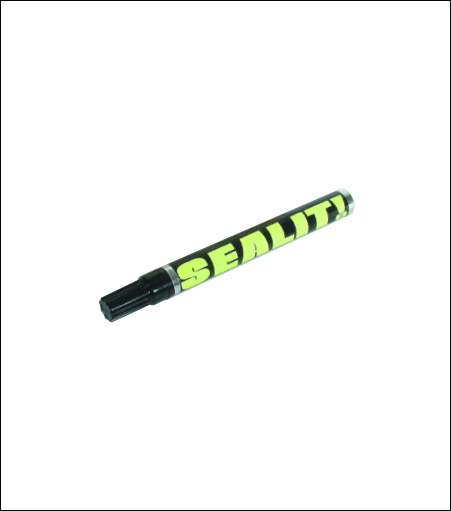 Sealitpen is compatible with all vinyl's, thermal and digital prints.